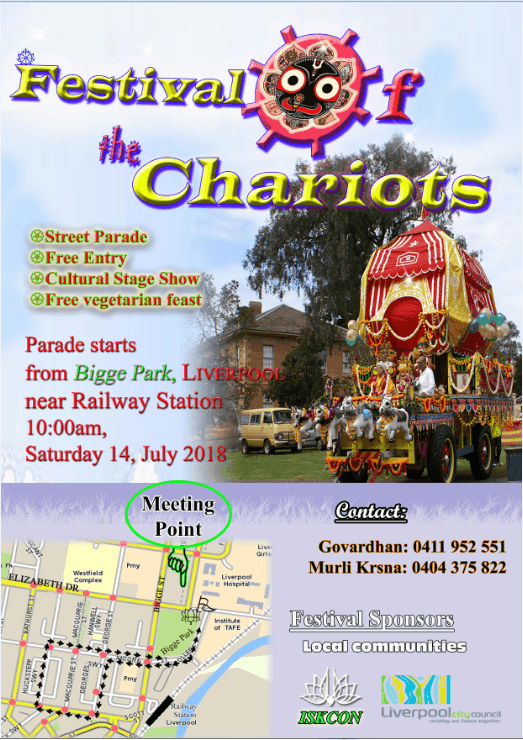 Lord Jaganatha has again agreed to personally come and give darshan to everyone in the famous city of Liverpool on Saturday, 14th July 2018 at 10am. Ratha Yatra, the festival of the chariots, is a procession of Lord Krishna in his form of Jagannatha, Lord of the Universe. Traditionally held during the month of June/July, in Puri, eastern India, where hundreds of thousands of pilgrims sing and dance in the procession, the festival now takes place in cities all over the world. The Vedic scriptures state that anyone who sees Lord Jagannatha or pulls His chariots achieves immense spiritual benefit, attaining liberation from the material world and entrance into the eternal blissful pastimes of the Lord. Anyone who has experienced the Rathayatra has surely experienced ecstasy. The mood of the day is charged with devotion, excitement and complete surrender as devotees brush the streets before the chariot. The sea of people in the procession call out loudly for the Lord´s attention as they eagerly await their turn to pull the cart or sweep the streets. The entire atmosphere is one of happiness, joy and celebration. Don’t miss this opportunity to personally pull Lord Jaganatha and rapidly progress in your spiritual life! Bring your family and friends along. All are welcome! Free Admission! Please forward this email to your family and friends.